NINH THUẬN – A number of agreements on investment projects in wind power, breeding and high-end resort construction, with a total capital of nearly VNĐ9.5 trillion (US$431.8 million) were signed in the south central Ninh Thuận Province on Saturday. The signing took place in the province’s Investment Promotion Conference in the presence of Prime Minister Nguyễn Xuân Phúc. Speaking at the conference, Phúc urged the province to give more specific policy commitments to win investors’ confidence. The PM held that Ninh Thuận had a high potential for growth thanks to its favourable location as well as its natural and cultural benefits. However, he noted that the province ranked 42nd among 63 localities nationwide on the provincial competitiveness index, which was behind many adjacent provinces. “Ninh Thuận is also home to only about 2,000 businesses, far fewer than the country’s average figure,” he said. PM Phúc suggested the province increase the number of enterprises, while revising its strategic planning towards a green economy and sustainable growth. The local government must change their mindset in management, creating a favourable development space for enterprises and locals, while becoming more active and determined in improving its investment environment, the PM said. Highlighting the need to protect the environment during industrial expansion, he urged the local administration to require investors to pledge to close their factories if they are found to violate environmental protection rules. Introducing the province’s potential, the provincial Party Committee Secretary Nguyễn Đức Thanh said Ninh Thuận was located at the junction of the south central, central highlands and southeastern regions. The province has the largest wind and solar energy resources in the country, which are favourable conditions for the locality to become a major hub of economic development, especially in green energy. With a 105km coastline, the province is also strong in salt production, fishing and the maritime economy. 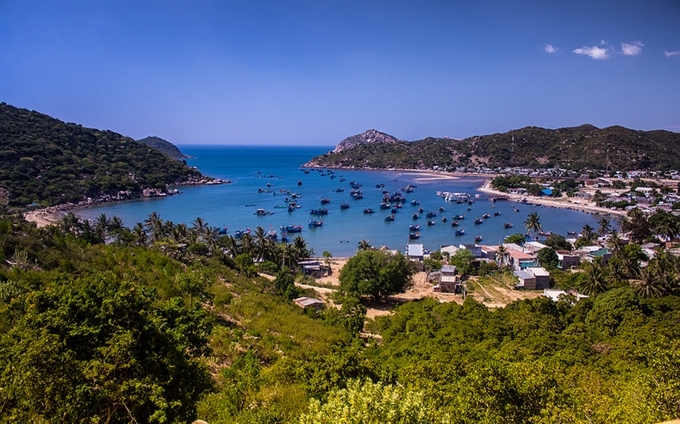 In addition, Ninh Thuận has great potential for tourism thanks to its beautiful bays such as Vĩnh Hy, Bình Tiên and Ninh Chữ. Currently, the province was encouraging investment in energy, tourism, agriculture, fisheries, industrial production, education, construction and real estate, Thanh said. Chairman of the provincial People’s Committee Lưu Xuân Vĩnh, said that investors coming to the province would only have to proceed to its Economic Development Office (EDO) to fulfill investment procedures. The EDO was expected to help reduce the time investors spent on administrative procedures by 30 per cent. Vĩnh said that this new model was designed in response to the Government’s Resolution No 19 and Resolution No 35 to assist businesses and create a smooth and transparent investment environment. Earlier the same day, the PM attended a ground-breaking ceremony for the Trung Nam wind power plant, the first of its kind in Ninh Thuận, invested in by Trung Nam Wind Power Company, a subsidiary of the Trung Nam Group. Located in Lợi Hải and Bắc Phong communes in Thuận Bắc District, the 90MW plant will be built at a cost of VNĐ3.96 trillion ($177.48 million). The first phase is expected to be complete in the fourth quarter of 2017, providing green power to the province and the country. Also on Saturday, the Government leader witnessed the launch of construction work at the Bình Sơn-Ninh Chữ coastal urban area in Phan Rang City, with an investment of nearly VNĐ1 trillion.